Private lending has existed in some form for many decades, but the asset class gained significant traction post the 2008 financial crisis. Why? Prior to 2008, interest rates in the western world were ‘normalised’, in a range of 2-4%, meaning that private investors could earn a yield on cash simply by placing it in a bank. If investors wanted to earn more they could invest in government or corporate bonds or, for a higher degree of risk, they could invest in high yielding stocks. Post 2008, interest rates were lowered universally in order to help stimulate the economy, but the needs of HNWIs did not change – standards of living needed to be maintained, assets needed to match liabilities, but the ‘fixed income’ traditionally received from the bond markets no longer existed. At the very same time, risk appetite at banks – their desire to lend money – evaporated as ‘balance sheet management’ became the order of the day. Banks were simply focused on managing their bad debts (as well as their own liquidity), and so their interest in making loans to businesses dried up. The combination of these two factors gave rise to other liquidity providers, for example private lending funds, filling the void – lending to well-run companies and in so doing earning a yield which private (and institutional) investors wanted. Today, as can been seen from Exhibit 1 below, the private debt market has grown dramatically with both institutional and HNWI’s invested in the asset class. ‍Exhibit 1: Net flows from North American institutional investors into higher yielding fixed income assets ($ billions). Source: Financial Times, March 2017. 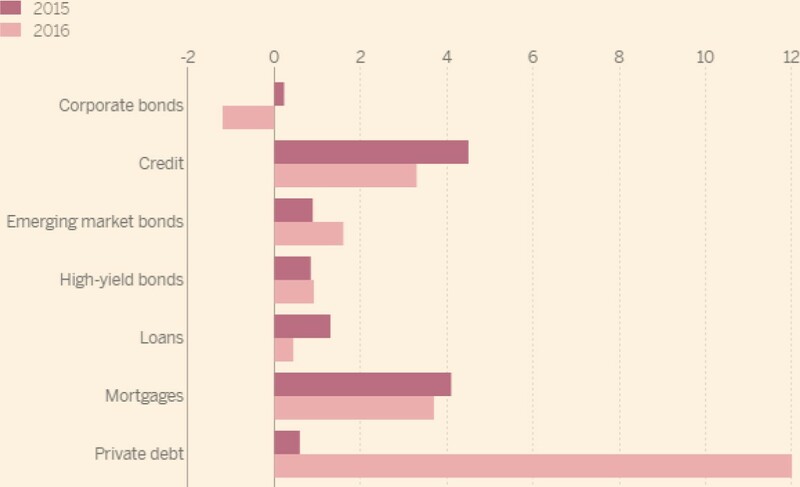 Where does Private Lending fit in a HNWIs Portfolios? What risk/return profile justifies an allocation? In today’s environment, fixed income in some form should be part of any investors’ portfolio and, in lieu of the lack of yield in the public markets described above, private lending should be a component regardless of a client’s risk appetite. For the most aggressive investor, they will likely still want to have a (small) portion of their portfolio which they can use to manage their income requirements. For more conservative investors, private lending will be a larger proportion as it can deliver very stable returns without correlation to the financial markets. The exact percentage allocation (to any asset class) in a client’s portfolio will be made up of their risk tolerance but also their liquidity requirements. As there is no free lunch when investing, extracting a 5-7% yield with daily liquidity and no correlation to the financial markets simply isn’t possible – the underlying loans which ultimately deliver the yield need to be made over a term (typically 6-18 months). Investors should therefore consider any allocation to private lending as less liquid. That illiquidity should be a factor in their risk/return profile. What current trends are in this space, what you are liking/avoiding? One concern I have is that investors (particularly pension funds) cannot ‘afford’ the lower returns on offer, as it further accentuates their asset/liability mismatches. Consequently, they are then required to either hunt lower down the credit spectrum or take more credit risk – which is perhaps one reason why we have seen large inflows into emerging market bonds in recent months (see Exhibit 2). 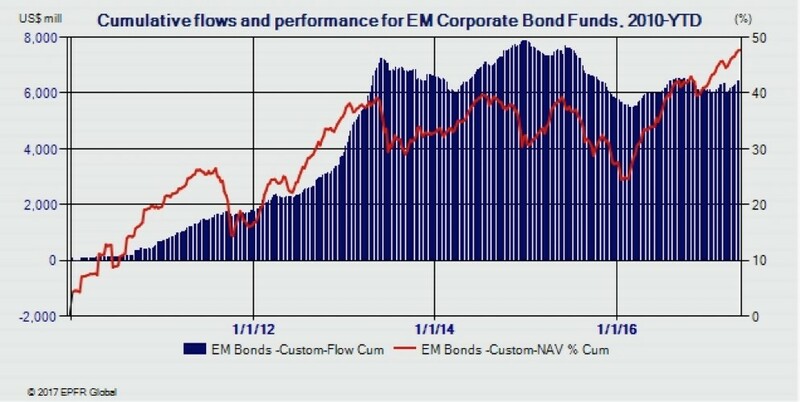 ‍Exhibit 2: Cumulative flows and performance for EM corporate bond funds, 2010-2017 YTD ($ millions). As Exhibit 3 demonstrates, a huge opportunity exists in the private lending space in Europe. Europe is far less developed than the US, where around 85% of all US finance comes from sources other than banks compared with only 20% in Europe. 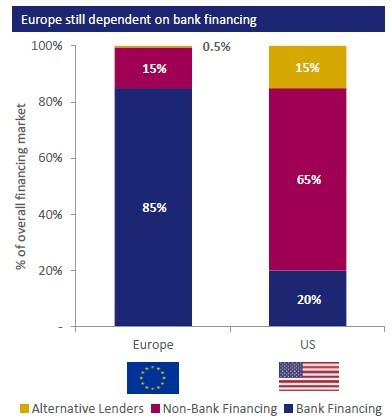 Additionally, EU alternative lenders only account for 0.5% of the financing market. ‍Exhibit 3: Europe some way behind the US. What returns have been like? Returns in private lending can vary substantially based upon the loan amount, size/history/jurisdiction of the counterparty, duration of loan and level of collateral held against the loan (amongst other things). At Blu Family Office, we focus on loans that are less than 12 months in duration and are always fully secured. The strategies that we allocate to have never had a negative year and are very consistent. Risk is low, volatility is low, and performance has been on the high end of expectations at 5.5% (annual yield). This strategy, established in 2014, aims to achieve long-term capital growth while seeking to minimise the risk of loss by strategically investing capital in an actively managed portfolio of private loans to Latin American companies. The portfolio is comprised primarily of medium term pre-export revolving facilities, medium term asset based loans, import financing and working capital loans. All loans are collateralised by different assets including export contracts, warehouse receipts and account receivables (amongst others). We chose the strategy to take advantage of the structural opportunity to provide capital to companies in the agribusiness and energy sectors in LATAM – a geography where prior to this investment we had limited exposure and where companies can struggle to access credit. The strategy is well diversified by counterparties and collateral and the manager in question has a strong track record dating back over a decade. Annualised returns have historically yielded 7-8% per annum, slightly above our portfolio objective. 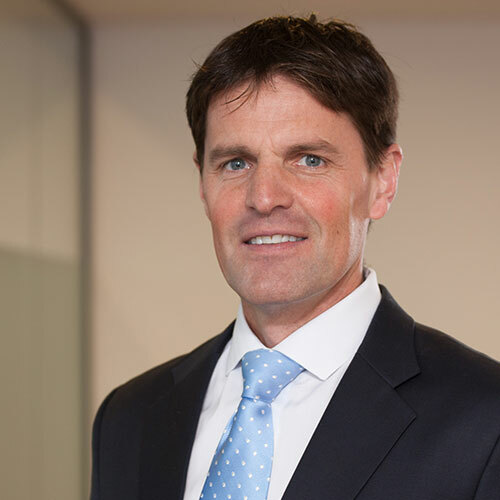 Nick Rees is the CEO of Blu Family Office, one of our strategic partners. He has over 18 years of investment banking and investment management experience.